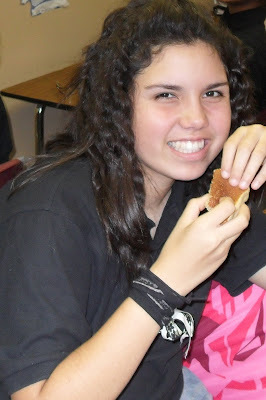 Diamond Ranch Academy | Clubs and Activities: Learning the SCIENCE behind FOOD is the best! Mr. Force, wearing his cooking visor, led the cooking crusade. First, he ground the wheat into a fine powder that resembles the pancake mix you would buy in a box. In a blender, he blended apples, honey, salt, basking soda, and some other ingredients. Mixed together, it looked like mush. apples and cinnamon quickly filled the room. 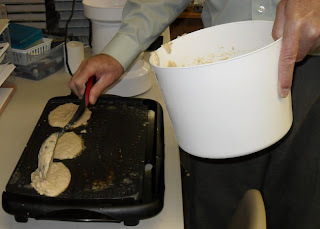 When they were done, Mr. Force handed us each a thick, fluffy, whole wheat pancake. He taught us that Pectin, an ingredient found in apples makes the pancakes fluffy. 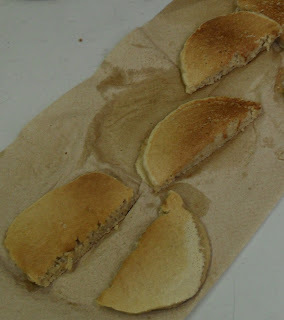 "These pancakes were amazing; nothing compares!" After our cooking lesson, we were rewarded with the treat of Force’s Cooking Corner. He told us the story of how he got his pancake recipe. He made it so that his kids would eat healthy, but also enjoy the food. As kids, we usually avoid good food because we don’t think it will taste good. This is symbolic in my life, because I avoided doing good things because I believed that life wouldn’t be as fun. As I learned from Mr. Force, I was completely wrong. If you simply spice up the recipe a little bit, I have found that doing good things can be just as satisfying and even more fun.